Advances in Skeletal Muscle Function Assessment, a publication of International Society of Tensiomyography, is a peer-reviewed print + online Semiannual journal. The journal's full text is available online at http://www.asmfa.org. The journal allows free access (Open Access) to its contents and permits authors to self-archive final accepted version of the articles on any OAI-compliant institutional / subject-based repository. 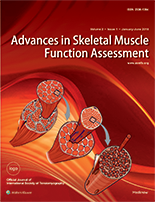 The scope of the journal involves, but is not limited to, publishing research, reviews and reports on various aspects of skeletal muscle function assessment, muscle physiology, injury prevention in sport, recovery and rehabilitation of injuries, sports training and performance enhancement, athlete screening, occupational medicine, work ergonomics, ageing research and new technologies in skeletal muscle function assessment. The contributing authors are strongly encouraged to submit articles with emphasis on technology and its application in physiology, sports, exercise, injury prevention, rehabilitation, occupational medicine, and relevant clinical fields. Advances in Skeletal Muscle Function Assessment, a publication of International Society of Tensiomyography, is a peer-reviewed print + online Semiannual journal.